2-Ethylhexanoic acid, a member of the medium-chain fatty acids family, occurs as a light-yellow-colored liquid with mild odor. It is commonly used in the preparation of metal derivatives that are soluble in non-polar organic solvents. Metal derivatives thus produced are used as catalysts in polymerization reactions. 2-Ethylhexanoic acid is generally used in esters for polyvinylbutyral film plasticizers and synthetic lubricants, in metal salts for paint dryers, in automotive coolants, PVC stabilizers, and cosmetics. The butyraldehyde method and the octanol method are two common processes by which 2-ethylhexanoic acid is produced. 2-ethylhexanoic acid is a carboxylic acid and it reacts with almost all bases with the release of a substantial amount of heat. 2-Ethylhexanoic acid can be oxidized by strong oxidizing agents and reduced by strong reducing agents. It initiates polymerization reactions and catalyzes chemical reactions. Based on method of production, the global 2-ethylhexanoic acid can be categorized into butyraldehyde and octanol. Butyraldehyde is a highly preferred and the most common method of production, wherein propylene is the major raw material used. 2-Ethylhexanoic acid is produced industrially from propylene, which then undergoes hydroformulation to obtain butyraldehyde. In terms of application, the global 2-ethylhexanoic acid market can be divided into PVB plasticizers, synthetic lubricants, paint dryers, PVC stabilizers, drugs, emollients, and others. 2-Ethylhexanoic acid is compatible with polyvinylbutyral and it exhibits good chemical resistance. Metallic salts of 2-ethylhexanoic acid are used as dryers in the production of odorless paints, inks, varnishes, and enamels. Metallic salts of 2-ethylhexanoic acid based on cobalt and manganese are commonly used as paint dryers. 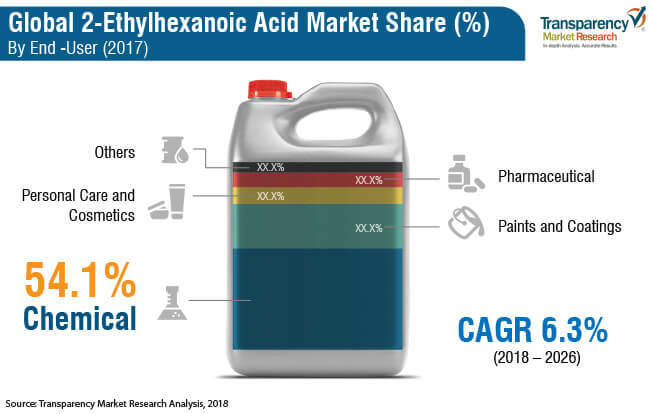 Based on end-user, the global 2-ethylhexanoic acid market has been classified into chemical, paints & coatings, personal care & cosmetics, pharmaceutical, and others. Increased demand for use of 2-ethylhexanoic acid as PVB plasticizers is likely to boost the demand for 2-ethylhexanoic acid in the near future. 2-Ethylhexanoic acid is primarily used as a PVB plasticizer, which, in turn, is used in the manufacture of glass. Use of 2-ethylhexanoic acid as a PVB plasticizer explores its property of enhancing the solubility. When used as a PVB plasticizer, 2-ethylhexanoic acid provides high transparency, impact resistance, high tensile strength, and elasticity. Rising usage of PVB films and sheets in building & construction and infrastructure sectors is expected to increase the demand for 2-ethylhexanoic acid in the near future. Increase in the demand for 2-ethylhexanoic acid for use as a PVC stabilizer is another major factor driving the global 2-ethylhexanoic acid market. At high temperatures, chlorine and hydrogen from PVC start getting eliminated and the release of hydrogen chloride becomes evident. 2-Ethylhexanoic acid prevents emission of chlorine and hydrogen from PVC. Demand for PVC for use in applications such as pipes and fittings, window profiles, wires and cables, coatings, and flooring is on the rise. 2-Ethylhexanoic acid is likely to witness increase in the demand from corrosion inhibition and cosmetics & personal care applications. Due to presence of various ions as well as high temperatures and pressures, automotive engine components are exposed to corrosion. 2-Ethylhexanoic acid acts as a corrosion inhibitor and prevents failure of engine components. 2-Ethylhexanoic acid is used as emollient in personal care products and cosmetics. It functions as a skin- and hair-conditioning agent in personal care products. 2-Ethylhexanoic acid is used as a lubricant on the skin’s surface in order to obtain soft and smooth appearance and gloss. Increase in population and rise in awareness about personal hygiene are likely to act as growth opportunities for the 2-ethylhexanoic acid market in the next few years. Advancements in the industrial sector are likely to boost the demand for 2-ethylhexanoic acid across the world in the near future. Asia Pacific is a major region of the global 2-ethylhexanoic acid market, owing to presence of key manufacturers in countries such as Japan and China. Production of 2-ethylhexanoic acid is highly concentrated in countries such as Japan, Germany, and Sweden. Stringent regulations on the emission of volatile organic compounds have enhanced the consumption of water-based coatings. Water-based coatings do not require dryers, which eliminates the need for dryers such as 2-ethylhexanoic acid. Thus, emergence of water-based coatings is likely to restrain the 2-ethylhexanoic acid market from 2018 to 2026. The 2-ethylhexanoic acid market is dominated by a few multinational players. This leads to intense competition in the market. Manufacturers such as The Perstorp Group, BASF SE, The Eastman Chemical Company, Elekeiroz, OXEA Chemicals, and KH Neochem Co., Ltd are some of the leading players operating in the market. Capacity expansion and acquisitions are a few strategies adopted by these companies to retain their market position. Large players are highly integrated, which helps them decrease production costs and gain a competitive edge in the market. Key players are focused on the innovation of new technologies in order to gain market share and serve a diverse range of end-user industries. 2-Ethylhexanoic acid is a colorless liquid that is commonly used as a plastic stabilizer, drying agent, emollient in cosmetics, processing aid in drugs, wood preservative, and corrosion inhibitor. Commercially, 2-ethylhexanoic acid is produced by using the butyraldehyde method. Addition of 2-ethylhexanoic acid metal salts to PVC increases its resistance to high temperatures. It also functions as a thermal and color stabilizer in alkyd resin plastics. 2-Ethylhexanoic acid is used as a drying agent in paints, enamels, varnishes, and printing inks. 2-Ethylhexanoic acid is combined with metals to produce metal salts and these salts are then added to solvents to function as drying agents. Cobalt and manganese are highly used with 2-ethylhexanoic acid to manufacture paint drying agents. 2-Ethylhexanoic acid is used as emollient in cosmetics, due to its high hydrolytic stability. Sodium salt of 2-ethylhexanoic acid combined with other fungicides is employed to protect cut wood. In terms of method of production, the global 2-ethylhexanoic acid market has been classified into butyraldehyde and octanol. Several manufacturers employ the butyraldehyde method, as it is a cost–effective method. In terms of application, the global 2-ethylhexanoic acid market has been segmented into PVB plasticizers, synthetic lubricants, paint dryers, PVC stabilizers, drugs, emollients, and others (wood preservatives, coolants, etc.). In terms of end-user, the global 2-ethylhexanoic acid market can be divided into chemical, paints & coatings, personal care & cosmetics, pharmaceutical, and others. Rising use of 2-ethylhexanoic acid as a PVB plasticizer, which is further utilized in the glass industry, is anticipated to fuel the global 2-ethylhexanoic acid market during the forecast period. Use of 2-ethylhexanoic acid as a PVB plasticizer imparts high transparency, gloss, and impact resistance to glass products. Demand for 2-ethylhexanoic acid for use in PVC stabilization applications is also on the rise. Use of 2-ethylhexanoic acid as an automotive coolant and in personal care applications is anticipated to offer immense growth opportunities to the 2-ethylhexanoic acid market in the next few years. Advancements in nanotechnology and material science are expected to propel the 2-ethylhexanoic acid market in the next few years. Technological advancements in developing economies are likely to provide significant growth opportunities to the global 2-ethylhexanoic acid market in the near future. Japan and China are major countries contributing significantly to the 2-ethylhexanoic acid market in Asia Pacific. In the paints & coatings industry, water-based coatings are gaining significant popularity, as the technology is completely eco-friendly. In solvent- or oil-based coatings, drying agents are required, which emit volatile organic compounds (VOCs). 2-Ethylhexanoic acid is used as a drying agent in solvent- and oil-based coatings. Thus, emergence of water-based coatings is likely to restrain the 2-ethylhexanoic acid market in the next few years. The report analyzes and forecasts the market for 2-ethylhexanoic acid at the global and regional levels. The market has been projected in terms of volume (tons) and revenue (US$ Mn) for the period from 2018 to 2026. The study includes drivers and restraints of the global 2-ethylhexanoic acid market. It also covers the anticipated impact of these drivers and restraints on the demand for 2-ethylhexanoic acid during the forecast period. The report also highlights opportunities for growth of the 2-ethylhexanoic acid market at the global and regional levels. The report comprises detailed value chain analysis, which provides a comprehensive view of the global 2-ethylhexanoic acid market. Porter’s five forces model for the 2-ethylhexanoic acid market has also been included to help understand the competition landscape of the market. The study encompasses market attractiveness analysis, wherein end-user industry segments have been benchmarked based on their market size, growth rate, and general attractiveness. The study provides a decisive view of the global 2-ethylhexanoic acid market by segmenting it in terms of method of production, application, end-user, and region. These segments have been analyzed based on the present and future trends. Regional segmentation includes the current and forecast demand for 2-ethylhexanoic acid in North America, Europe, Asia Pacific, Latin America, and Middle East & Africa. The report also covers individual end-user industry segments of the 2-ethylhexanoic acid market in all regions. The study includes profiles of major companies operating in the global 2-ethylhexanoic acid market. Key players profiled in the report include The Perstorp Group, BASF SE, The Eastman Chemical Company, Dow DuPont Inc., OXEA Chemicals, Elekeiroz, and KH Neochem Co. Ltd. These players account for a major share of the total production of 2-ethylhexanoic acid. Moreover, they are forward integrated. Brand promotions and launch of new products are likely to raise sales of 2-ethylhexanoic acid in the next few years. Market leaders look for different measures such as strategic pricing and product improvement in order to increase their profit margin. The report provides the estimated market size of the global 2-ethylhexanoic acid market for 2017 and forecast for the next nine years. The size of the global 2-ethylhexanoic acid market has been provided in terms of revenue. Market numbers have been estimated based on method of production, application, and end-user and regional segments. Market size and forecast for each segment have been provided for the global as well as regional markets.